Ms. Phenix’s choice of language such as “very rarely” and “highly unusual” seems stern. Of course, her comments were from a defensive position wherein she was being questioned about the magnitude of Pitino’s potential $7+ million buyout. Were her comments reasonable? 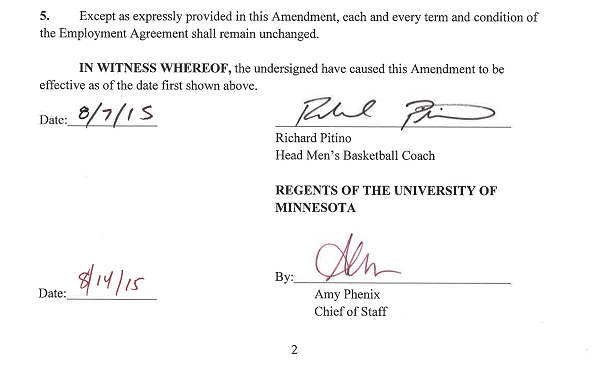 Our simple research takes us back to the last time Minnesota extended a men’s basketball coach. 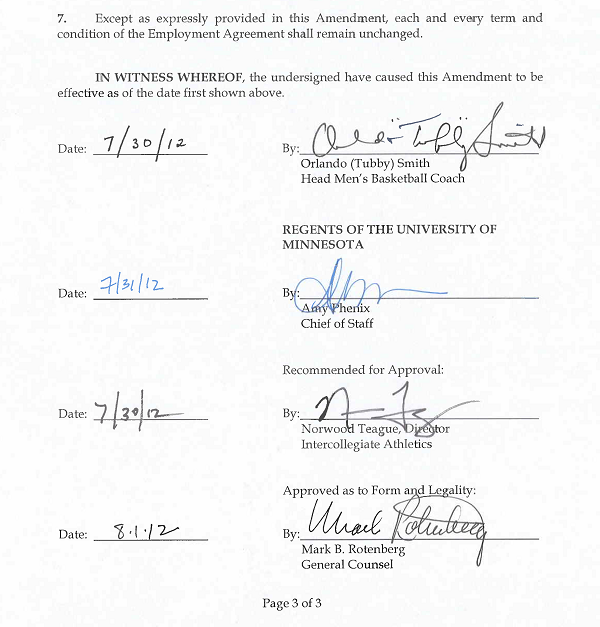 Three years prior to Ms. Phenix inking the Pitino extension, she signed the extension of Tubby Smith (see below for excerpt of the contract; Ms. Phenix dated her signature July 31, 2012). In a turn of events that Ms. Phenix would presumably describe as “very rare” and “highly unusual,” less than 8 months later Minnesota fired Smith not for cause. Even if firing a coach not for cause less than a year after an extension is entered into truly was “very rare” and “highly unusual”, the structure of the buyout continues to be troublesome well past year one because of how it slowly amortizes over times (more details on this at a later date). The rhetoric coming from the ‘U’ on multiple athletics-related issues over the past several years has made one thing obvious: you can’t take what they’re stating at face value and believe it.